THE Brave Gladiators earlier this week travelled to Botswana confident to win one over their rivals in the hope of securing a spot in the 2020 Tokyo Olympics Games. A total 20 players today received a sendoff from Sports Minister, Erastus Uutoni, at the Football House. Namibia will take on Botswana over two legs, with the first leg away in Gaborone, while the return leg will play out in Windhoek four days later. 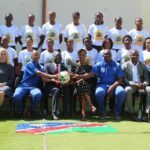 Uutoni, along with the Normalisation Committee and officials from the Namibian Sports Commission, witnessed the announcement of the travelling 20 ladies by Head Coach Brain Isaacs. Isaacs also announced the new Brave Gladiators captain, Spanish-based Zenatha Coleman who plays for Valencia. Emma Naris is the vice-captain while Anouchka Kordom, who plays in the United States, was not considered due to injury. Uutoni told the players to play for each other and brand Namibia. “Go and play for your country. People should know about us. You should market your country and in the game, you should play as a team and do not keep the ball too long. Play to score and win and prepare hard and do us proud,” Uutoni said. The minister added that it was high time that other players of other races such as Ccoloreds and Whites are included in the team. “We need to pull together as a nation. Whites should also play football, boys and girls, and form part of the national team”, Uutoni said. At the same occasion, midfielders Beverly Uueziua and Millicent Hikuam, were presented their professional contracts as they embark on new chapters in their football careers. Uueziua will play in Taiwan for FU Jen Catholic University Girls on a one-year renewable contract starting on 28 April 2019 while Hikuam stands a chance to play alongside compatriot Anouchka Kordom for Corban Warriors in the United States on a football scholarship pending academic test results before 30 April 2019. If all goes well, she will then join the University for four years. The Gladiators left for Gaborone today with the game set for Friday. The two teams will travel back to Windhoek on Saturday morning in order to prepare for the second match on 9 April at the Sam Nujoma Stadium in Windhoek. The winner over the two legs will face South Africa in the second round. Zambia or Zimbabwe will then wait in the third round. There will be fourth and fifth rounds, with the winner of the fifth round qualifying for the 2020 Olympic Games and the losers to try their luck against Chile for a place in Tokyo. 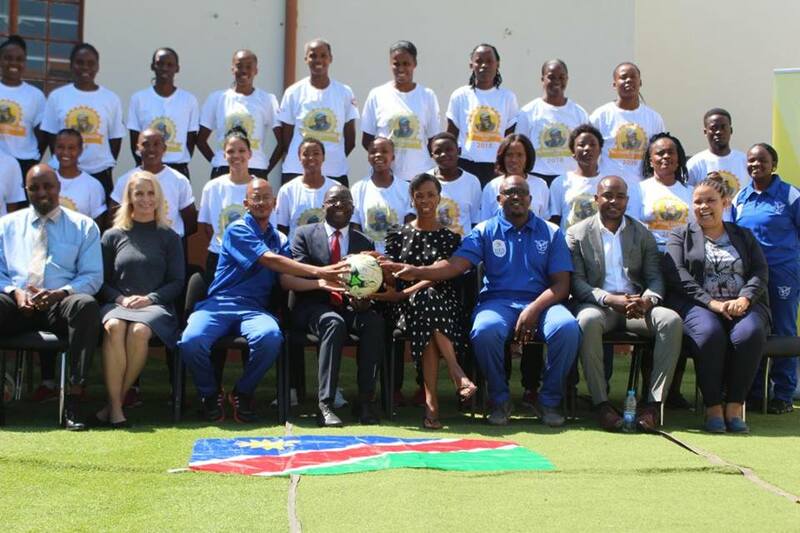 The Brave Gladiators that traveled to Botswana are: Mellissa Matheus, Ester Hamukwaya, Lydia Eixas, Ndapewa Katuta, Emma Naris, Uerikondjera Kasaona, Lovisa Mulunga, Lorraine Jossop, Twelikondjela Amukoto, Veweziua Kotjipati, Millicent Hikuam, Beverly Uueziua, Memory Ngonda, Juliana Blou, Julia Rutjindo, Asteria Angula, Kylie van Wyk, Zenatha Coleman, Thomalina Adams and Anna Marie Shikusho.